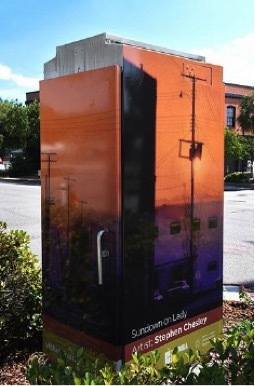 The Congaree Vista Guild and the Vista Neighborhood Association announce that they have successfully fundraised for and wrapped 15 highly visible traffic control boxes in the Vista with vivid images of work by local artists. Members of the Vista Neighborhood Association (VNA) are residents of the Vista, which is a South Carolina Arts Commission-designated South Carolina Cultural District. Over the years, the district has grown to include Columbia’s top hotels and more than 80 bars and restaurants, and historic preservation and fostering a culture for the arts are ideas central to the Vista Guild’s goals for growth. In a project initiated by the VNA, wrapping these boxes with images of art work and the Vista Guild’s logo give visitors a sense of the Vista’s artistic aesthetic, which makes the district unique. In planning for the new art work, the Vista Neighborhood Association applied for and was awarded an Action Grant from the City of Columbia and a Connected Communities grant from Central Carolina Community Foundation. The Vista Guild contributed to the effort, Thirsty Fellow and Twisted Spur hosted fundraisers and members of the VNA also contributed. The Vista Guild will celebrate the wrapped boxes from 5:30 – 7 p.m. in the Aloft Hotel lobby (823 Lady St.) on Sept. 20. For more information about the Vista, please call Meredith Atkinson at (803) 269.5946. Follow the Vista Guild @VistaColumbiaSC on Twitter, Instagram and on Facebook.